Spinach Salad Recipe -Low in calories, rich in antioxidants & flavor. 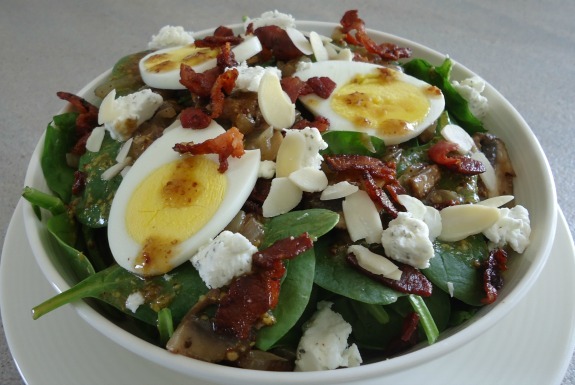 Love this spinach salad recipe as it offers zesty and warm bursts of flavors. We all know how important eating spinach has become as this vegetable offers buckets of nutrition and antioxidants. Also this green leafy vegetable is so low in calories that it helps us give a little wiggle room when it comes to adding the dressing. There are many recipes to choose from and since we already enjoy a kids spinach salad that’s served cold we like to make this one offering a warm dressing just to keep things exciting. We particularly like this recipe as it is enjoyed both by family and guests for a delightfully different appetizer that is sure to please. It is also a healthy salad that is easily modified to your suit your taste buds, so get creative, nothing is set in stone. Place the eggs in a pan, cover with cold water and turn stove on high heat until water begins to boil. After a minute or so remove from heat, cover pan and let sit for about 15 minutes. Then remove eggs and place into cold water for about 10 minutes, then peel, slice and set aside (the cold water makes them easier to peel). Place the spinach into a large bowl and set aside. In a frying pan cook chopped bacon until crispy, then remove with slotted spoon and place bacon chunks on paper towel lined plate. Pour off the majority of the grease from the frying pan into a separate container and set aside for now, leaving only enough grease you need for sautéing. Add in the sliced mushrooms and onions to the pan and sauté over medium heat until the veggies are starting to turn brown. Once browned remove and also set aside in separate dish. Add 3 tbsp of bacon fat (or olive oil) back into the same frying pan and turn stove to medium heat. Now we can whisk in the vinegar, honey, mustard and salt and pepper to taste. Once dressing taste to your liking remove from stove top. Now add onions, mushrooms and dressing to the spinach leaves and toss well. Separate into 4 serving dishes. Add the slices of one egg to each serving. Also sprinkle each serving with bacon pieces and crumbled goats cheese. Serve immediately to enjoy the warmth and zesty flavor of the dressing. This is a great dish when entertaining guests as it offers something a little different and less traditional. Have fun with the recipe and change it up to whatever you think might make it even more special. Perhaps dried cranberries, pecans or mandarins or whatever you think would be your own creative twist.